1. Debone the chicken legs till the joints, remove the thigh bone, keep the leg bone, and hit the piece with the back of the knife. Add yogurt, ginger-garlic paste, lemon juice, turmeric powder, and cashew nut powder to a bowl and mix well. 2. Add caraway seeds, cardamom powder, crushed peppercorns, cream and mix well. Add chicken, coat it well with the paste and put in the refrigerator to marinate for 24 hours. Cook the chicken on high heat, till it turns golden brown. 3. Cover and cook for 10 to 15 minutes on medium heat in a clay pot. Finally, serve it hot and garnish with coriander sprigs. 1. Wash and blanch the fresh mushrooms and then mince them. Add yogurt, ginger-garlic paste, lemon juice, turmeric powder, cashew nut powder, salt, chilli powder, garam masala, cardamom powder, crushed peppercorns, and cream and mix well. 2. Add the minced mushrooms, coat well, and refrigerate it to marinate for 24 hours. 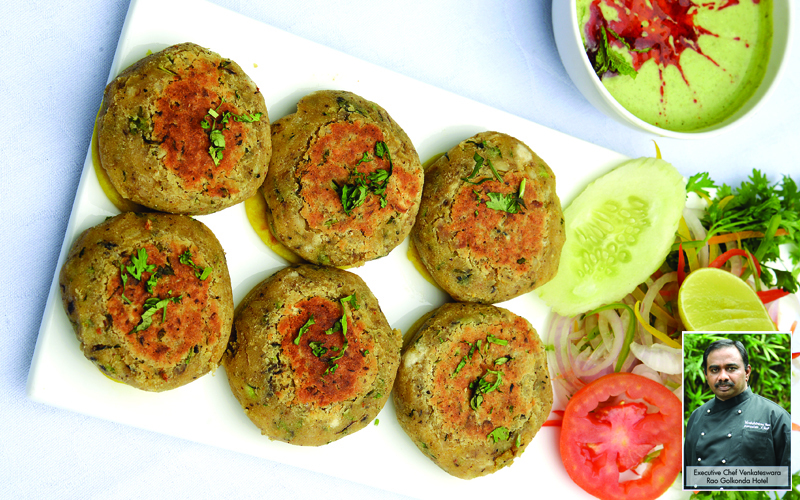 Make the mushrooms into small patties and cook it on a tawa at moderate heat till it turns golden brown. Serve it hot and garnished with coriander sprigs.